Free Shipping Included! 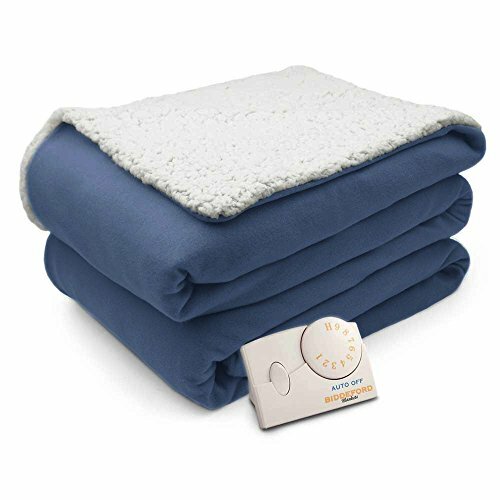 Pure Warmth Comfort Knit Natural Sherpa Electric Heated Blanket Twin Denim by PURE PLANT HOME at Shop For Less. MPN: 1030-9031RM-503. Hurry! Limited time offer. Offer valid only while supplies last. The Pure Warmth by Biddeford Comfort Knit Fleece Heated Blanket with Natural sherpa is just the thing to warm you up on those cold winter nights. The Pure Warmth by Biddeford Comfort Knit Fleece Heated Blanket with Natural sherpa is just the thing to warm you up on those cold winter nights. This magnificently soft polyester blanket is just great for getting warm. Analog controller features 10 personal heat settings, allowing you to get just the right temperature for you. The twin and full size blankets include one controller. The queen and king size blankets include two controllers. *Note for Customers Outside of North America. These heated bedding products were made to work with 110V Electrical systems. If you live in a country that utilizes a different electrical system you may need to use a converter for these products to function. The act of using a converter automatically voids the warranty on these products. **All Pure Warmth Biddeford Blankets are rigorously tested and approved by a third party (UL or ETK Intertek) to comply with current industry safety standards. Please reference the included use and safety instructions and attached product label picture to insure safe operation. Additional safety certification for this product can be viewed on the UL or Intertek websites or by calling their perspective customer care phone numbers.